This interview was done in Museo Negrense de La Salle. They are currently hosting “Lumbayag” the one-man show of Ramon de los Santos. This will run until July 12. For details please email Them at museum@usls.edu.phor call (34) 4345998. Sir Ramon De Los Santos and one of his art pieces. BFH: Mr Delos Santos, Paano ka nag sugod sa art? DLS: Nagsugod ko since bata pa ako, When Iwas a small boy hilig ko mag drawing- drawing sa kalsada, sa bala… amo na ang kalingawan ko. Then during rainy season baga kutkot ko sang daga sang gina iligan sang tubig. Ga pangita ko sang medyo sticky na clay. Gina ubra namon na cya sang toys. Daw dira ko ka experience.. dira ko nag amat amat sa art dayon daw na appreciate sang teacher ko na advanced ko sa art dayon ga upbra na sila sang mga project or may gina pasunod sa libro daw dira ko na discover. De Los Santos’ art captures the simple joys of childhood. BFH: So ikaw ang classroom artist! Sino ang teacher mo, dumduman mo pa sanguna? DLS: Dumduman ko pa si mam Gomez. BFH” Ano gid ang gin suguran mo? DLS: Drawing lang bala.. mga one line strokes lang. tao tao.. dayon clay. 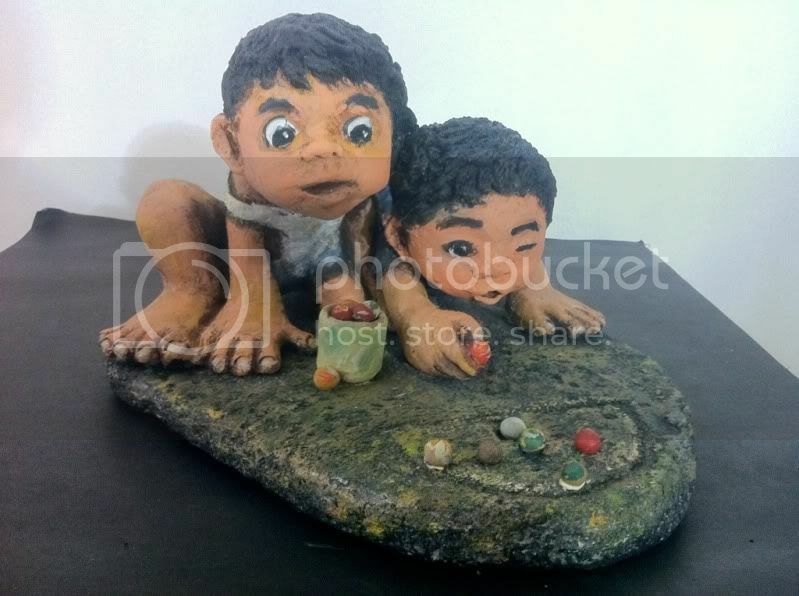 Dayon ga ugtas ang mother ko kay ga hinilaw ang iya na tigang kay gina luto ko ang clay sa dapog. Daw dira nag start ang tanan. BFH: Ga basa ka man comics ang una? DLS: Ga basa basa man kag ga sunod sunod man drawing sang tsura sang tao. Biskan ano lang gina drawing ko mga landscape..kung ano man lang madumduman ko. Kids Playing on a hammock. BFH: Te ang motif mo halin sang una mga bata? Daw ka sadya man tulukon. DLS: Before indi ni cya mga bata gina ubra ko. Ulihi na lang ni siya. Sang nag start ko exhibit ang ubra ko sang una about nature, about destruction sang nga tao. BFH: Daw ka dulom ba. BFH: Paano mo na isip na mga bata ang theme. DLS: Well amo na no, gina palibugan ko. Ga lakat ang mga inadlaw then one time ka kita ko one time a group of children playing dira bala sa gwa. Tumba patis. Daw na lingaw man ko sa pagkatanaw then nag sulod sa ulo ko nga indi ko sila pag ubrahon kay biskan ako na lingaw sa ila na pagkahampang. Then amo na nag sulod sa ulo ko na himoon ko sila subject sang akon work. Mga 2006 and 2007 ko na nag sugod ubra. BFH: Ano ni cya ang ga kabit sa pader? Clay on driftwood? DLS: Ini cya sa wall mga slab na cya made of wood, gin butangan ko sang terracotta kag alambre te mixed media na cya. BFH: Ang na namian ko na pieces mo sang una ang mga bata na ga holen kag ang ini na bahi na ga baligya sang mga masskara ! Ka tahum! Ka sadya sang mga expression sang mga bata kag ka tahum ang pagka ubra. DLS: Huo. Na bakal na to ang mga ga holen. One of my favourite De Los Santos Pieces. BFH: Diin ka ga kwa sang inspiration sang mga ubra mo? DLS: Ga ka kwa ko inspiration sa mga smiling face sang mga kabataan kag na recall ko man ang time sang bata ko. Ang mga games subong daw ka layo na gid compared sang una. Subong high tech na gid. Mga cellphone gina hampangan. After the interview Mr De Los Santos drew my portrait! Wow! Awesome! Thank you very much sir! De Los Santos’ portrait of Me! Awesome! I hope you guys enjoyed the article and take the time to learn about our local artists and our blossoming art scene! Please help us maintain this site by clicking on the ads found on the page. Take care and see you guys again next month! Hello! This is the Bacolod Food Hunters and we’re here today with one of Bacolod’s famous local artists: Mr Ramon De Los Santos! BFH: Mr Delos Santos: How did you get into art? DLS: I started when I was little. When I was a small boy I liked to draw a lot. I drew on the sidewalk, on the sand. That was my way of entertaining myself. Then during the rainy season I would dig up some earth from the drainage ditch. I would look for some slightly sticky clay. The kids back then would make this clay into toys. I think that was my first art experience. That was when I first got into art and my teacher appreciated that I was quite talented in art so she began asking me to make little things for the class, projects or drawings copied from books. BFH: So you were the classroom artist! Do you remember the name of your teacher. DLS: I remember it was ma’am Gomez. BFH: What else did you do back then? DLS: I did mostly drawing. My drawings were mostly one line strokes. Then some clay. My mother would scold me because her cooking would be interrupted because I would bake clay in the fireplace. I think it was because of these things that I got into art. BFH: Did you read a lot of comics as a child? DLS: I would read a little and copy the drawings of people’s faces. I would draw anything such as landscapes, etc. Anything that I could think of. BFH: Was your main motif children ever since? Your art is fun to look at! DLS: Before I didn’t have kids as my motif. When I first started my main theme was about the destruction of nature by humans. BFH: That’s a very dark theme. BFH: How did you chose children as your next theme? DLs: Well, I really thought about it for several days. Then one time I saw a group of children playing a game. I enjoyed watching them play then it occurred to me that people would enjoy children playing in my art. So thats where it started. I started around 2006-2007. BFH: What’s that hanging from the walls? Clay on driftwood? DLS: On the walls are slabs of wood with wire and teracotta figures. Mixed media. BFH: My favorite pieces are the kids playing marbles and the girl selling masks. So beautiful! They have fun expressions and they are really well made. DLS: Yes. Someone already bought the children playing marbles. BFH: Where do you get inspiration for your pieces? DLS: I get my inspiration from my childhood and the faces of the smiling children that I see. The games today are very different from my childhood. Kids today play with high tech toys such as cellphones. Thank you for featuring Ramon de Los Santos. This interview was done in Museo Negrense de La Salle. We are currently hosting “Lumbayag” the one-man show of Ramon de los Santos. This will run until July 12. For details please email us at museum@usls.edu.ph or call (34) 4345998.